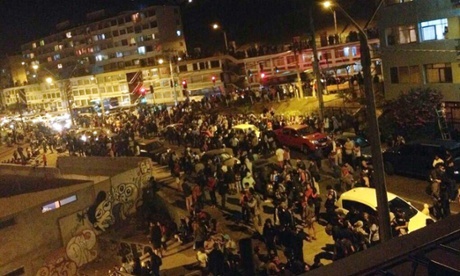 An earthquake of magnitude 8.2 has jolted northern Chile – triggering a tsunami alert and the evacuation of thousands of people from coastal areas. At least five people were killed and more than 300 women escaped from a coastal prison. The quake was centred under the Pacific Ocean 61 miles north-west of the city of Iquique and struck at 8.46pm as thousands of residents were arriving home from work. As sirens blared and emergency warnings urged residents to evacuate by foot to higher ground, in coastal cities traffic jams ensued as panicked residents sought to escape the coast. The first tsunami surge measured 2.5 metres (8.2ft) and flooded low-lying areas of Iquique including a medical clinic and bus terminal. Major damage was reported to Highway A16 between Pisagua and Iquique, a port city of about 182.000 people about 65 miles south. About 300 inmates escaped from a nearby women’s prison, officials said. With the exception of Iquique, the area closest to the epicenter of the quake is largely desert and sparsely populated. Pisagua has fewer than 300 inhabitants, and the town of Arica, about 120 miles north of Iquique, has about 10,600 residents, according to recent census data. The Arica and Parinacota regions where the quake was felt strongly have a combined population of about 215,000 and are known largely for their mining and fishing industries. The temblor knocked some residents off their feet and frightened a country where massive earthquakes have killed thousands of people. This entry was posted on Friday, April 11th, 2014 at 8:58 am	and is filed under Catastrophes. You can follow any responses to this entry through the RSS 2.0 feed. You can skip to the end and leave a response. Pinging is currently not allowed.